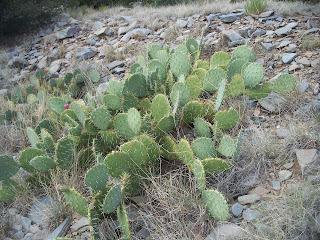 Engelmann’s Prickly Pear (Opuntia engelmannii) is common across the Southwestern United States and into Mexico. At the base of the nearby west-facing foothills of the Sandia and Manzano mountains of central New Mexico it can be found growing in association with Gray Oak, Turbinella Oak, Pinon Pine, Rocky Mountain Juniper, Mahonia, Tree Cholla, and Bear Grass. 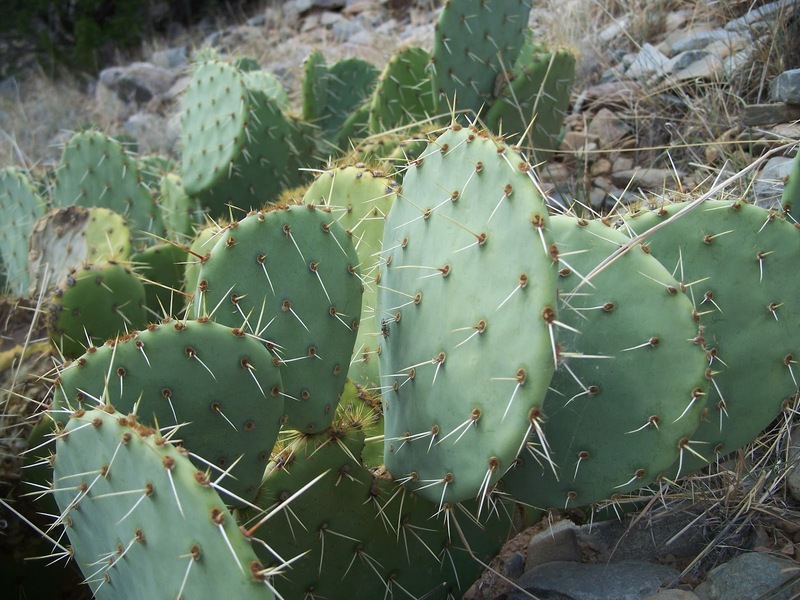 Engelmann’s Prickly Pear is also commonly called Texas Prickly Pear, Desert Prickly Pear, Prickly Pear, and Nopal. Engelmann’s Prickly Pear forms clumps 3’ to 4’ tall and wide or larger. Engelmann’s Prickly Pear does not form stalks, like yuccas, but adds new prickly pear pads annually to existing pads. Pads are normally a pale green color and can have a diameter of up to 12”. 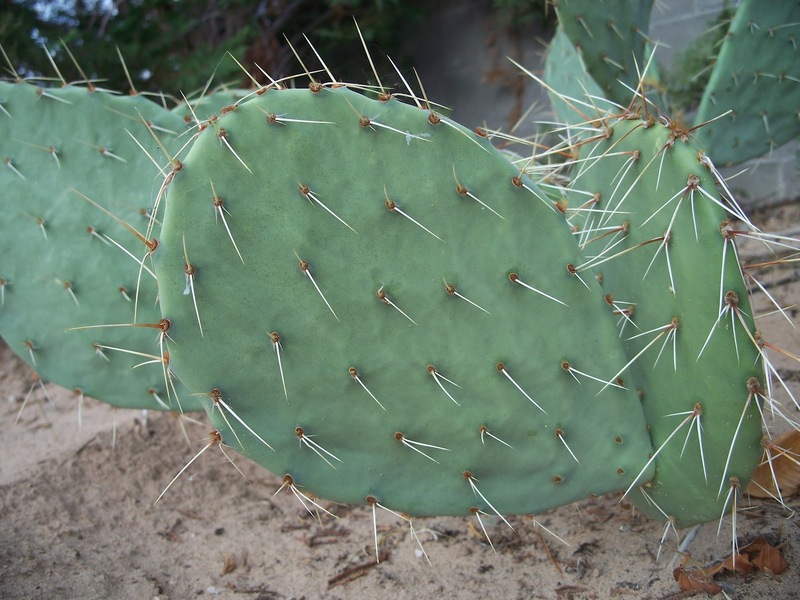 Engelmann’s Prickly Pear has long white or yellow spines and clusters of smaller hair-like spines called glochids. Each cluster contains numerous glochids that easily come off into the unprotected skin and causes irritation. Glochids may be difficult to see but you can definitely feel their presence. They can be easily removed with tweezers. 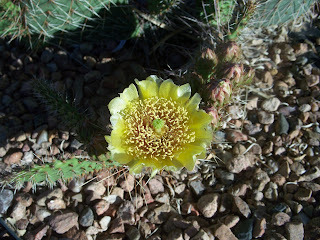 Engelmann’s Prickly Pear produces yellow flowers in spring or early summer. Red-purple fruits called tunas form by summer. 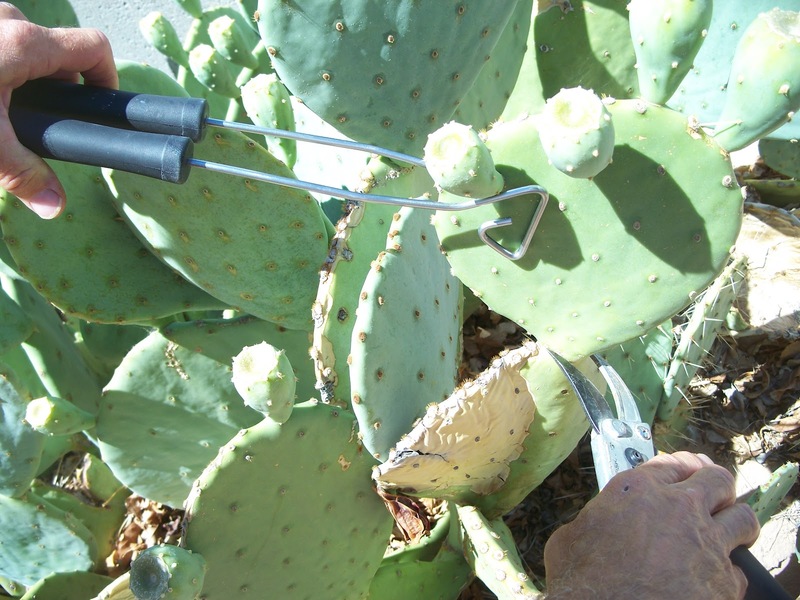 Tunas of Engelmann’s Prickly Pear are edible after removing any surface spines or glochids. This is easily done by burning them off over a fire. Fruits are also used to make jelly, cactus candy, and syrup. 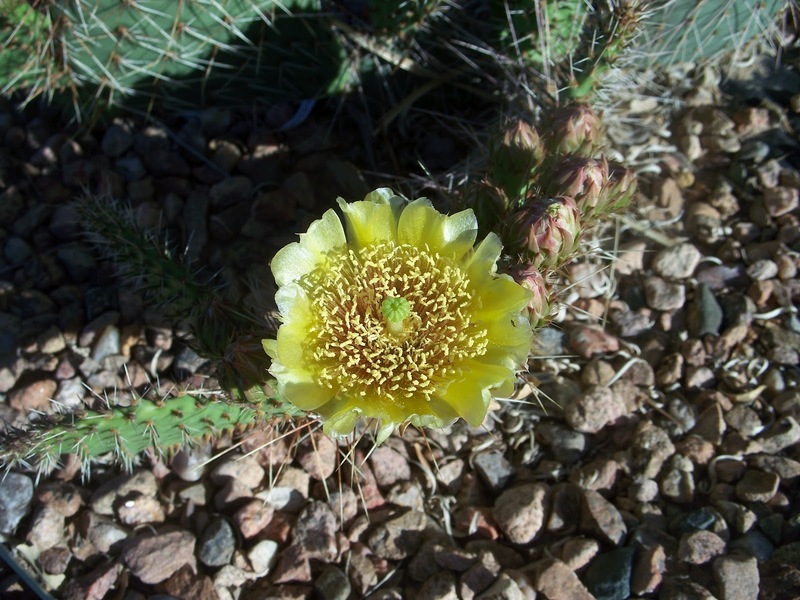 Engelmann’s Prickly Pear is a low maintenance, colorful addition to any hot, dry, landscape. It needs only occasional watering during summer. It is also useful as a defensive perimeter anywhere you want to discourage movement, under windows, walkways, or walls. 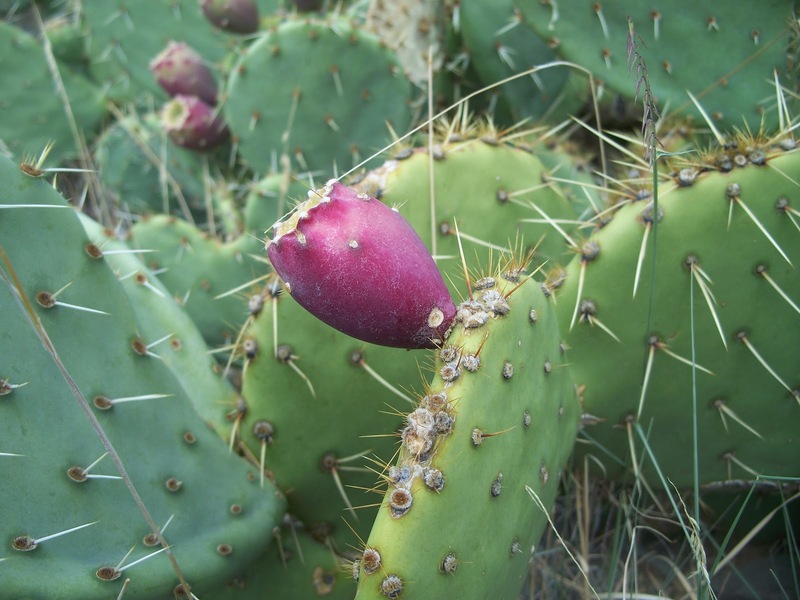 Eventually your prickly pear may need reduction in size. This is easily done using Barbeque (BBQ) Tongs and Pruning shears. Hold the pad with BBQ tongs and cut pads at the point of connection to another pad. Over winter Prickly Pear pads droop. Winter droop (wilt) is normal and does not indicate any growth problems. As the warmth of spring returns and water movement within the plant resumes your prickly pear will again perk up. 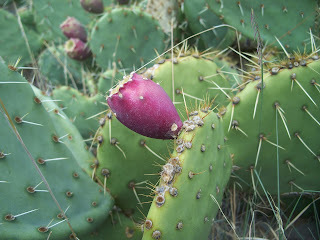 Engelmann’s Prickly Pear is best grown in full sun, with low water, and is hardy to USDA zone 6. Stop by Trees That Please Nursery for more information and availability. Time to Save during our October Sale!!!!! Fall is Feeding Time for Plants! !